For a consistent supply of cutting material, it is beneficial to have a dedicated plant for this role. Diseases: It is important that the mother plant is well protected from disease. Cuttings taken from a diseased mother plant will most likely be contaminated, even if the actual cutting appears disease-free. Be aware that the mother plant also needs to live for a longer period of time than other plants. Therefore, take every possible precaution to help preserve its health. For example, ensure the nutrient solution is regularly disinfected. Pests: Pests can weaken the mother plant and increase the risk of disease. Inspect regularly for pests. Yellow sticky traps are useful as an indicator of predators being in the growing area. Light: Where the mother plant is grown under artificial light, “blue” light should be used for at least 18 hours* per day. This will promote vegetative growth and help keep the donor in the vegetative phase. Blue CFL’s are generally suitable. However, ensure the light is used effectively by shaping the plant so that the foliage is as close as possible to the lamp. Where possible, rotate the plant periodically. This will help produce even growth. Use a 250-400W MH lamp if the CFL produces insufficient cutting material. *Some growers find it more convenient or beneficial to run lights 24 hours per day. Rooting potential: Use a mother plant that produces cuttings that root easily. Be aware that even plants of the same genus can have rooting speeds that vary widely. Therefore, experiment accordingly. Shaping and pruning: Shape the mother plant so that multiple stems are created. 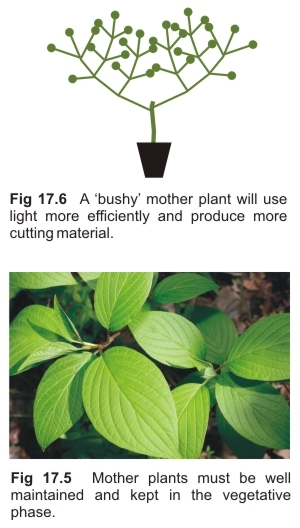 A bushy plant will use light more efficiently and produce more cutting material (Fig 17.6). Dead leaves: Remove any dead leaves from the mother plant. These are an ideal host for disease or pests. Fertilizer: Use a complete ‘grow’ formulation and maintain EC and pH at the optimum levels for the medium being used. Where the nutrient is being recirculated, ensure to discard and replace the nutrient regularly. Humidity and temperature: Maintain relative humidity (RH) at 50-70% and day-time air temperature at ~25OC / 77OF. Pot size: An under-sized pot will cause the mother plant to become root-bound. This can dramatically inhibit growth. How long will the mother plant last? Do not expect the mother plant to last forever, even if it remains healthy. It is common for the rooting speed or general performance of cuttings to diminish with the mother’s age.